You’ve probably heard that you can tell a lot about person from their choice of music, or their favorite color. Well the same can be said about the type of books a person prefers. 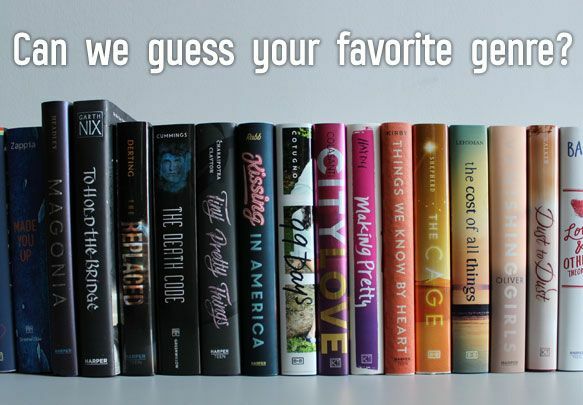 Most of us have our favorite genre, so let’s find out what your favorite genre may tell people about you. If you are into Sci-Fi books then it is probably safe to assume that you aren’t into sports or lounging on the beach. You would probably rather spend your time watching Star Wars or a Star Trek marathon, and there is nothing wrong with that. Relax and enjoy – and may the force be with you. Fans of romance novels enjoy taking some quiet time to consider matters of the heart. Your idea of an awesome weekend is enjoying a chick flick marathon with an endless supply of Ben and Jerry’s (preferably Chunky Monkey flavored). You are a fan of romantic walks on the beach and you enjoy that sweet, uplifting feeling that can only be found with a happily ever after. There are some readers who just really enjoy a good old fashioned who dunnit. You consider yourself to be a bit of a master sleuth and pride yourself on always being able to guess the culprit before the last chapter. Fans of this genre tend to be naturally curious – and maybe just a wee bit nosy. So you like a little blood and gore. Despite enjoying their reading to be a bit bloody, fans of this genre are normally quite peaceful, choosing to express their dark side by living vicariously through the characters in their favorite books – and the rest of us hope they keep it that way. Who doesn’t enjoy a good laugh? Fans of this genre tend to be witty and playful. As a humor fan you are the life of the party and we all thank you for it. Fans of Non-Fiction take tend to be very serious. You don’t get along well with those that favor the humor genre and you roll your eyes at the romance readers. After all, you know that life is not a joke or some fairytale land. You have business to attend to and don’t have time for silliness and dreamers.